Take advantage while the sale lasts! Do you need coax or antenna support line? Automatic tuners in most current rigs will tune this antenna. The CAROLINA WINDOM® has been used by 'Big Gun' DX'ers, Little Pistols, and DX'peditions for 25 years. You get the same sort of performance in only 69 feet. * Based on user reports, field evaluations, and product reviews. Gain is due primarily to the low angle radiation pattern. The 20 meter performance is even better then the standard CAROLINA WINDOM® in most installations supported above 45 feet. This is due to the special geometry and stacked effects of the CAROLINA WINDOM 80 Compact's folded elements. ** 80 - 10 meters: 1500 watts CW/SSB duty-cycles. 6 m: 200 watts CW/SSB duty-cycles. This antenna is not rated for AM, RTTY and other high duty-cycle modes. It can be used on PSK-31 at 100 watts transceiver output power. The performance of the CAROLINA WINDOM® - half the length. Imagine the same performance choice of 'Big Gun' DX'ers and DX'peditions. Since 1992, you heard the CAROLINA WINDOM from Navassa and Albania among many other DX'peditions. 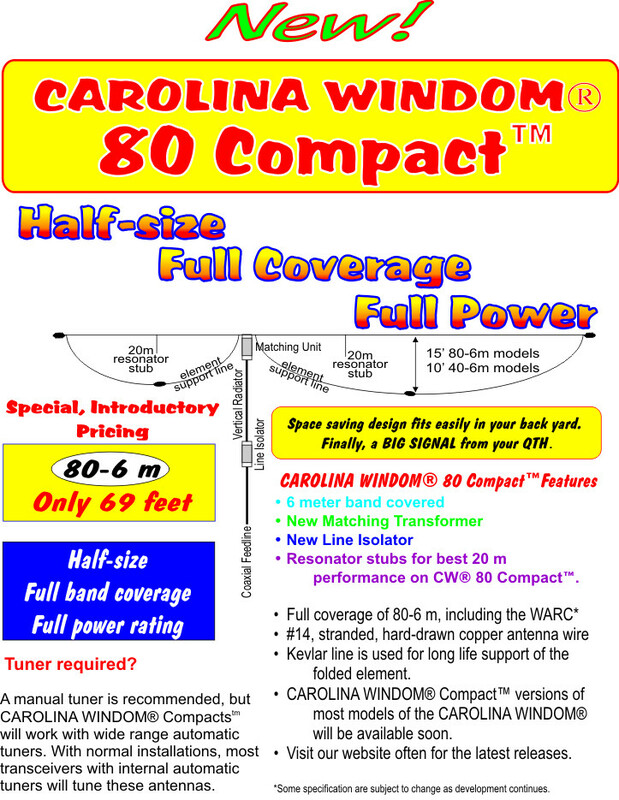 Why not take advantage of their big signal secret with the CAROLINA WINDOM® Compact? This antenna can give you an S-unit or two advantage. You can't buy so much added performance for so little money anywhere else! The CAROLINA WINDOM® was the first antenna to take advantage of 'VERT' (Vertically Enhanced Radiation Technique) and this feature continues with the CAROLINA WINDOM® Compact. VERT (Vertically Enhanced Radiation Technique) is a radiating feed line technique that produces a controlled, low angle vertical radiation pattern. The effect is absent from most ordinary antennas. Field tests, user reports and seven product reviews confirm that the CAROLINA WINDOM® will give you a remarkable performance advantage. The off-center fed CAROLINA WINDOM® provides unusually good performance on all bands covered, including the WARC bands. It's an ideal antenna for those of you who do not wish to use a tower and beam. The CAROLINA WINDOM® is also ideal for those of you who want a high performance antenna to cover the bands not covered by your beam antenna. The secret is the Vertical Radiator. Combined with the Dedicated Matching Unit and special Line Isolator, the Vertical Radiator is responsible for the low-angle vertical radiation pattern. How does the CAROLINA WINDOM® compare with other antennas? Flat-top, suspended between two tall supports > 70' apart. An Inverted-V configuration is permissible but the angle between legs should be > 140 degrees. The real CAROLINA WINDOM® story and Trademark credits. Go to Jim's Notebook: Look up "How long should wire antennas last?